Smaller feet benefit from a smaller board because the skater has better balance and it’s easier to maneuver. It’s like riding a bicycle that’s too big for you – riding a big board won’t stop you from riding it’s just not as much fun. Lucky for us – there’s a skateboard company made by the parents of real skateboarders who faced the dilemma of where to find a small board by making them. I recently needed a small board for a new friend. So I headed over to SkateXS in Carlsbad to build one. To be honest I thought I was going to watch them build the board, but turns out these are some hands on people so I used tools. You start building your board by selecting your deck. First figure out your deck size. 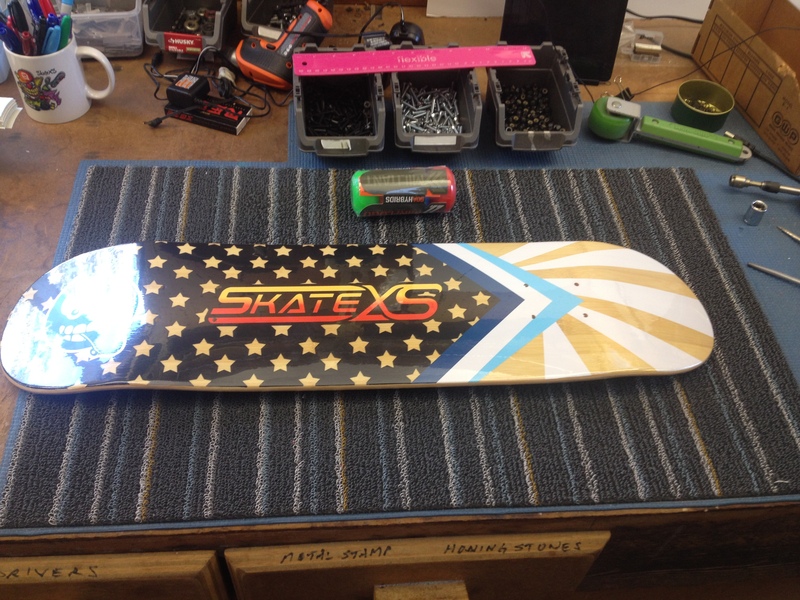 SkateXS recommends skaters under 60lbs (generally ages 5-7) find a deck that is 7″ wide and 28″ long. Skaters between 60-80lbs (generally ages 8-10) find a deck that is 7.25″ wide and 29″ long. Skaters over 80lbs can safely start to use “standard” skateboard decks which start at 7.5″ wide and about 31″ long. Then consider the graphic – yes it’s true it will get scratched but it’s still an expression of you & your beliefs so make sure it’s something you’ll like today and tomorrow. The next thing to select is grip tape. Grip tape is the gritty, sand papery layer that’s applied to the top of a skateboard deck, so that your shoes can grip the board. Not everyone is going to warn you about this – but I will – grip tape can ruin your clothes. Always be mindful of the grip tape or you’ll get snags in your clothes. Be creative with your grip tape – we used red and blue and personalized it with a name. 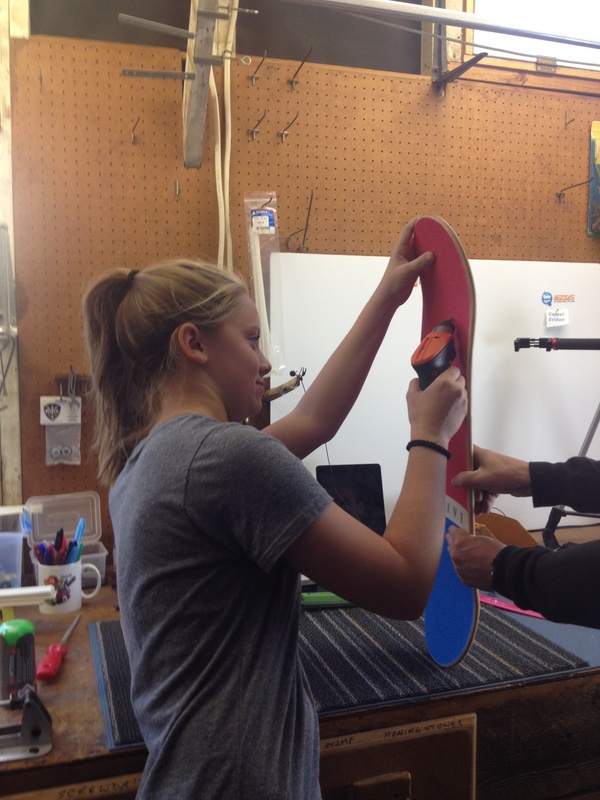 Applying grip tape is a process onto itself. Yes, they trusted me with a razor and yes by some miracle I got it on without bubbles but my future is not in grip tape. Moving along I was entrusted with several drills which I used to get the trucks and wheels on with. For details on how all these parts work – I highly recommend checking out the SkateXS Parent’s Guide to Skateboarding – they cover safety, equipment, basics, and FAQ. For this board which will be used both on the street and the park – we used softer wheels. And because we used a pack of different colored wheels we kept our warm and cool colors separated. Want to get a fabulous board like this without the work – easy buy a complete. SkateXS offers completes for beginners, advanced and pro. You of course can customize yours and you don’t have to live near Carlsbad. SkateXS ships internationally. Like Goldi Locks – you don’t want a board that’s too big, or a board that’s too little – you want the board that’s right for you. Same goes with your wheels and other equipment. All the stuff you read are guidelines – as you skate you’ll feel what you like better and that’s what you should ride. Stay tuned for who’s getting this board – hint he’s a very special five year old whom I recently met at a Learn to Skate Clinic. 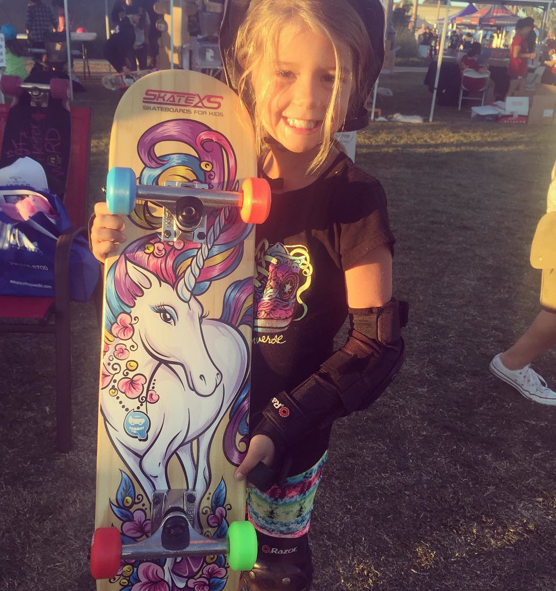 ps – this lucky girl won a SkateXS at EXPOSURE Skate because her parents entered the silent auction. Thanks to all the parents, organizations, and individuals who support girls skateboarding! It was such a blast having you come visit and build such a special board with us! 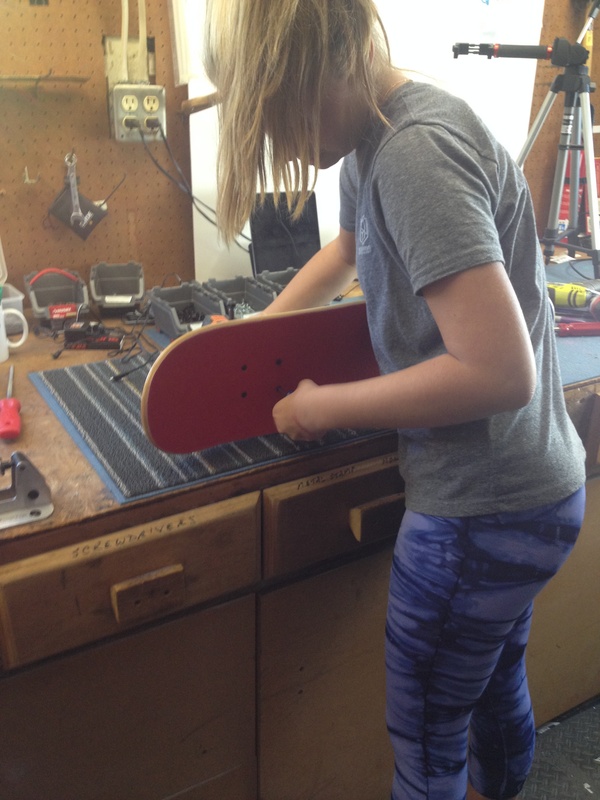 You did an awesome job on the skateboard and wow, what a fun blog post! Keep up the great work!